New Year’s Eve… A night that many people celebrate as they anticipate the hours and minutes until their life is supposed to transform. Expectations have increased, goals have been set and everyone is excited to watch themselves grow as the year progresses. They watch fireworks, drink champagne, and eat good food until the ball drops. But as they enjoy the holiday vibes, they all secretly wonder if they can accomplish their New Year’s resolutions. You might be one of those people anxious to see what the New Year will bring. Maybe it’ll be something as simple as an opportunity that will take your life into a new direction, which is exactly what the right virtual internship can do. A virtual internship allows you to be more versatile. You can gain experience from anywhere and you don’t even have to travel. All you need is a reliable internet connection and a laptop, then you can literally have success at your fingertips. Who wouldn’t want to start the New Year off with an opportunity like that? Besides being easier to access, there are other benefits that this type of internship can provide. There are many different companies looking for virtual interns to help them with the redirection or enhancement of their company. An example would be here at SuperInterns.com. 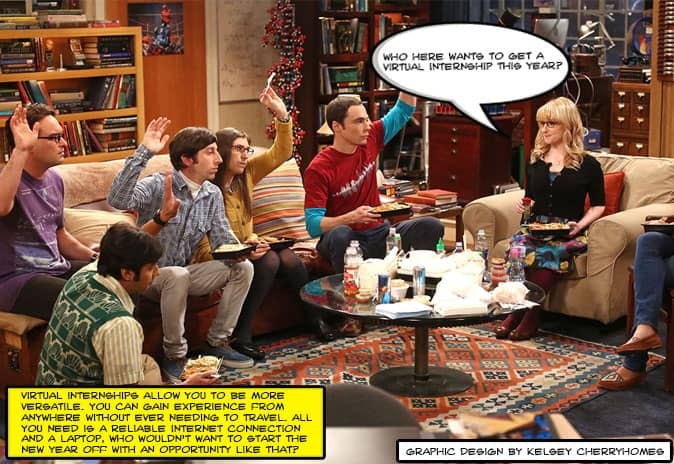 We have many different options for potential interns. Whether your interests include graphic design, social media, marketing, human resources, or blogging, there are many opportunities for you to do what you want. HOW DO I KNOW A VIRTUAL INTERNSHIP IS RIGHT FOR ME? Now, all of these things may sound great, but I’m sure you may have some concerns. When embarking on a virtual internship journey, it can be easy to feel discouraged. Some people haven’t been able to fully understand the idea of working from home because they don’t feel as if it’s as productive as being in an office. In some cases, this may be true, but this is when you have to figure out the type of person that you are. There’s often a misconception that virtual interns and people who work from home are lazy. But that couldn’t be further from the truth. You actually have to be the opposite of lazy in order to succeed in this type of position. So if you are generally good at managing your time, being on top of your work, and taking initiative, then you would be a great virtual intern. However, if you always rely on others to check on your work 24/7, then a virtual internship may not be for you. Finding the right anything in life can be difficult if you don’t know yourself or your interests. Start with that and you will know which internship will be just right for you.